Welcome to the haunted hovels section of Haunted places in Minnesota. Please select a link below to view information on that location. This restaurant was once a brothel and also a morgue. Patrons and staff members have reported that they have seen an old woman walking upstairs during the evenings. She has also been seen reflected in the mirrors as the staff have being cleaning off the tables. The old woman is believed to be friendly as she has never cause anyone harm. Not only is this bed and breakfast reportedly haunted by a little girl, a bride, but also two cats, and the current owners late husband, plus the two original owners. But, the best part is that the current owner is psychic, and will give readings to guests if they choose to make an appointment. This hospital has tunnels leading underground that link the buildings together. The mentally ill patients were known to try to escape using these tunnels, were caught and murdered, or committed suicide by hanging themselves from the pipes along the ceiling of the tunnels. Spirits have been heard laughing and whispering, and have been known to appear in the tunnels, which are now closed except to the security and maintenance staff. There have been several reports of sightings of a figure who seems to look like a clown. This 'clown' does not seem to be harmful, but only stares at you. The only apparent intent is to scare people away from the wooded trails. Sightings have been reported mostly at dusk, just as the sun sets. This school is believed to be haunted by a girl possibly named Alana. In the hallway, if someone is alone, they would hear footsteps, that are really close to them. But when they turn around, they see no one, but they can still hear footsteps. In the girls toilets, someone had written Alana 6-1978. The caretaker cleaned it off, but a few days later, it is still there, in the exact same postion, in the same hand writing as if it had never been cleaned off. There is a night club that sits in the western part of Duluth called Spirit Valley. The building was built in the late 1800's and previously stood at four stories tall, now it is only a single story due to a fire. Even though no one was hurt or killed in the blaze, the bar has quite a lot of reports of paranormal activity. It was quite a colorful place at first, being a reported 'house of commercial affection', a gin mill, then a speak easy, etc. There are a couple of ongoing events that are common occurance. Close to the west doors are a couple of pool tables, just off the far right corner of these there is a corner drinks table where many people have had been either shoved, poked brushed or had their pool cue bumped only to turn and discover that there is no one there. The other occurance is that of an elderly woman who shows herself only to men. Mostly the men who work there. Many staff members have heard the toilet doors open and close, slam shut, swing open violently, the back security door open and slam shut, and no one being there. Adding to this is that it mostly happens after closing time when only the staff is there cleaning up, with perimeter alarms set so that if anyone was in these areas it would set the alarms off. Sadly this building burned down in about 2007. The fire, coincidentally, started in the attic where the haunting allegedly occurred. Several employees say they have heard many voices talking. When they have checked all over, they have found no one around. On one occasion event, a typewriter has started typing by itself. Another time, a very old record player started playing by itself. And another time after hours, all three of the night employees were in the staff room on the second floor, and they heard the small service bell ring. They all went downstairs and nobody was found anywhere in the building. There was nothing that could have fallen on the bell, or to have made it ring. There is a toilet in the basement that is never used, and one day two employees were upstairs when they heard a loud crash. When investigating downstairs, they realized the toilet seat was down, when it had been left up. All these events occurred over wide period of time, and are not very frequent. The employees all wonder as to what happens during the five months that the museum is closed. Many ghost encounters have reportedly occurred here. People have claimed to bear witness to a black ghost sitting on the balcony of Noyes Hall. The lights often go out in Noyes Hall and also in Tate Hall. Witnesses have also claimed to see a number other ghosts on the campus. The origins of these spirits are unknown. Several people have heard footsteps coming from the kitchen area going to the end of the hall by the toilets. The footsteps have been heard nightly between the hours of 11 and 12 pm. 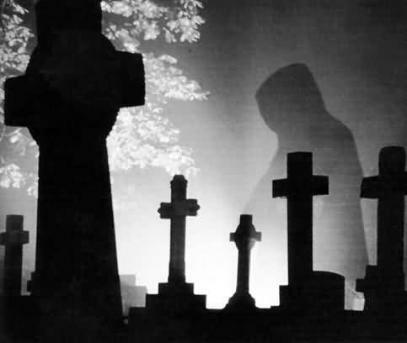 Also, apparitions have been seen of a tall gentlemen, standing about 6 foot tall wearing a long black cape. There have been no facial characteristics noticed due to light coming from behind the apparition. There have been reports of a ghostly monk dressed in a brown robe that runs out into the road just in front of the monastery, between the hours of midnight and one a.m. Witnesses say this monk has ran right out in front of their car and they thought they were going to hit him. Then he completely disappeared in front of their eyes. He has been described as being tall, thin and quite young, in his 20s or early 30s. Apparently before the church was built, it used to be a Catholic school. The current office was built where one of the nun's offices was. Witnesses have said that they see her around the church frequently. She has been rumoured to be the cause of calls to the Lino police depatment in places where there are no phones, such as the religious classrooms. The people who work in the office have experienced doors opening and slamming shut, and also the piano player has witnessed the keyboard being played even though there was no one was sitting on the bench. Another witness said that she was sitting at her desk and a bible fell off the shelf. After replacing it, a few minutes later it fell back down, this when on for a while. One of the teenagers in the church said they heard heels walking behind her and there was no one there. Then she heard someone whisper 'Stop That!' No one was there. The Washington Avenue Bridge connects the east bank from the west bank which house separate portions of the campus. There have been reports of several suicides off of the bridge into the Mississippi river below, most often by students. Reports say that late at night if you walk through the tunnel you can sometimes hear footsteps following you. If you turn around they will stop, and then continue again when you start to move. Also, the University of Minnesota has had to remove several flags from the bridge, because they were being ripped down by an unseen force. Even while it was under surveillance. This club is reportedly haunted by at least two spirits. One of them is reported to be the ghost of the farmer that used to live on the current golf club grounds and is actually buried on the first hole. He has been seen watching the clubhouse from various locations on the course as the employees lock up at night wearing a hat and overalls. The second ghost is of one of the Golf Club founders. He has been spotted sitting at the bar and peering in windows as, again, employees lock up at night. Televisions have turned on by themselves long after they have been turned off and the air conditioner dial will mysteriously turn itself down past 50 degrees without anyone touching it. This is believed to be the most haunted place in Moorhead. Witnesses say they have heard and seen the spirits of a young girl and boy who were killed outside the school on prom night as an oncoming semi truck hit them head on. They have also been seen dancing in their prom attire at night. On many occasions people have witnessed wheelchairs moving from one end of the hall to another and seeing inprints of people that resided there while there is no one in the building. Many people have gone into this empty building and come out with sever mental disorders. The building is no longer standing but you can still see people that used to live there. This was once listed as 'Thief River Falls - The Old Insane Asylum'. There never was an insane asylum in Thief River Falls. However, a resident of the town for many years, knows the building that is being referred to. It was formerly located in Oakland Park, the three-story brick building built in the late 1800s was a sanitarium for tuberculosis patients. It served that purpose until Tuberculosis was eradicated in the 1950s. After that, the building was used as a nursing home until a new nursing home was built on the property in the late 70s early 80s. In the mid-1980s the building housed a dormitory for the local community college. The students that lived there were a little upset when the college failed to mention that the 'dorm' was about six miles away from the college. Needless to say, the building was only used for a few years as a dorm. It stood empty from that time and was used for storage for the nursing home. It was torn down a few years ago. There are some interesting features on the building and its history. A tunnel was constructed that lead from the basement kitchen to the nurses' quarters, that was a separate building on the premises, so that the staff could travel between the buildings without having to go outside in the winter. The Pipestone County museum is formerly the old city hall. A little blonde girl has been seen there by several people. She is dressed in a blue 19th century style dress with a white apron. Often, loud sounds are heard upstairs when no one is there, footsteps, stomping, etc. The old doctor's office is located off the library upstairs. Several employees and guests have heard the long since dead doctor 'working' in the office when no one is actually in there. The chair is heard squeaking and papers shuffle. The Redford Hospital has long been abandoned but the spirits still live there. There are many reports of the people that maintain the building that there are around 5 to 10 ghosts in the building. One in particular is a little boy who died in the Hospital because his mother abused him and then left him at the Hospital to die. People have seen the little boy usually on the 2nd floor. Some say he is still trying to find his Mother for revenge. It has been rumored that there have been numerous complaints and unusual encounters. The reason for this is many of the Mayo Clinic patients occupied that hotel and have passed away. One witness encountered an odd stench in the room, frequent temperature changes, and eerie sounds at night. Not far from the local racetrack lies the site of one of the first farms that lead to the eventual settlement of Shakopee. Located at the top of a hill is a housing development now known as Howard's edition. Nestled among the modern homes is the cities oldest cemetery and it contains graves that go back to the original families that settled in the town. The cemetery is quaint and is surrounded by a picket fence. Neighboring houses have reported to have had their cupboards rifled through and have found muddy footprints going through their homes, from no apparent source. There are also reports of cars stalling in front of the cemetery, and witnesses seeing a boy dressed in 1800s clothing peering at them from behind a tree. This is the oldest building on the campus of St.Cloud State University. It was built in 1904. In 1950 a caretaker murdered two teachers who had offices in the building. It was abandoned in 1968 for 'unknown reasons'. To date students have reported seeing a figure of a bald headed man standing in the doorways of the building. Some have seen lights flash on and off from outside. Rumors say that in the early 1900's a student at the St. Cloud Normal School had an affair with a caretaker at Shoemaker Hall, which was the dormitory for the students. She became pregnant and hung herself in the meat locker of the kitchen, which is now the basement. Shoemaker is still a dorm, and many students report objects being moved, clocks flashing impossible numbers, lights and TVs turning on for no reason, and an apparition of a woman floating above thier beds late at night. There are reports of a woman wearing gray that appears in the doorways of different dorms watching over the students. There are also reports of people feeling cold fingers on the back of their necks and being tapped awake right before their alarm goes off. Other times, there is the sound of a woman rushing down certain dorm hallways. Although these things happen, none are threatening. The Marian Center in St. Paul is a nursing home located in what was once the old Mounds Park Hospital. It was closed as a hospital sometime in the 1970's and reopened as a nursing home in the late 1980's early 1990's. The story says that an off duty policeman who was working as a security guard was shot and killed as he was getting off the elevator in the basement, which is where the morgue was located. There are four elevators in the building, but if you get on that particular elevator, no matter what floor you push, it will go straight to the basement, the doors open, and then close again before going to where it's directed. The employee break room is in the basement but it is rarely used, as staff have to walk past the old morgue to get to it and there have been strange noises heard there at night. There was also a tunnel from the basement leading to the old nurse's dormitory, which was once used for storage. The maintenance men disliked using it because they reported hearing strange noises and the lights flickering off and on. The property reportedly sits across the street from a group of Indian burial mounds. Ghostly figures have been seen walking through the aisles or sitting at unoccupied data entry terminals. Tax return batches regularly fly off of the shelves and when investigated, they always had multiple returns of deceased people in the batches. In the early morning noises could be heard of lockers being opened and closed. The cause was never found. Apparently an electrician died while the building was being constructed, it is unsure if he is the cause of this phenomena. This location was an orphanage in the early 1900s. Legend states that a young orphan girl living there died when she fell down the staircase in the orphanage, that staircase still remains in the restaurant today. Staff at the location report frequent occurrences of ghostly phenomena, including voices that don't belong to anyone, dishes falling off counters, and things in the storage room that move themselves from one side of the room to the other. They say that all of W-K is haunted, but one of the most haunted places is one of the forth grade classrooms. In this particular classroom a lot of strange thing happen like, things get moved when no one was there, strange noises come from the vents, and things fall when no one touches them. The students that went there previously are happy to get away from the ghost of W-K. The fourth floor used to be an infirmary for the nuns that lived there. Many people died up here and students say they can still hear many of them walking, crying, or just trying to talk to them. Everyone that has been inside of the YMCA at night agrees that it is haunted. The common belief is that it is haunted by an old caretaker that loved his job and cared about everyone there. They say if you are inside the YMCA at night and if you stay very quiet, sometimes you can here doors opening and a garbage can squeaking through the halls when no one else is there.